A few minutes later the rain started again, but I continued on across the bridge. By the time I reached the end, the rain was pouring down. Most motorists pull over to the side of the road to take their rain parkas out from under the seats of their motorbikes upon the first few drops, but for some reason I’m quite stubborn about this. I prefer to tough it out until it reaches a point where it comes down to my getting completely drenched or not. On this day, the decision was easy. I pulled to a stop under the hanging branches of a tree and put on my parka. I felt a little discouraged because I thought I wasn’t going to be able to get some wide-angle shots of the bridge and the river. Nevertheless, I decided to drive around a little to scout out locations for future shoots. Ten minutes later, the rain stopped again and soon after that I found a nice, secluded spot with a good view of the bridge. One final note about this day: In my youth I had some uneasiness riding over bridges stemming from dreams/nightmares that I had of bridges collapsing as I crossed them. I managed to work all of that out over the years, but I felt it again while riding on my motorbike. I guess it had something to do with being in the open air. 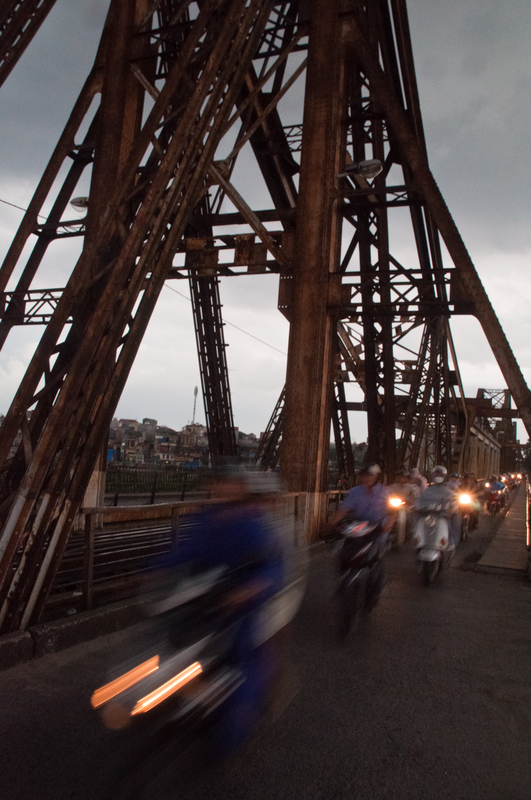 Still, it wouldn’t stop me from returning to Long Bien Bridge.